I've decided there's one thing worse than not having time to paint. That's having all of the time in the world to paint. The pressure can be enormous. Of course, I should be putting out lots and lots of work. What else is there to do? Some artists treat their practice like a job. They go into the studio at 8 a.m., take a half hour for lunch, return until 5 p.m. and then turn the light off until the next day. They work at it. Others, like me, are mood painters...have to feel the urge and want to do it. I subscribe to a twice weekly e-letter from Robert Genn (thank you, Wendy, for that suggestion) and he noted in one letter this week that a friend of his secured a two week residency and wrote that she didn't know what she was going to do with all of that time. There is the suggestion that plenty of time equals many more good works than usual and success each time. I decided today to use the time and just do it. As a result, I went through six pieces of watercolor paper. I can balance chores with watercolor, as you need to let the piece dry between applications, and having to fold clothes or do dishes fills the time nicely and forces you to walk away from the painting. That way, if the painting doesn't pan out, at least I feel like I got something done. 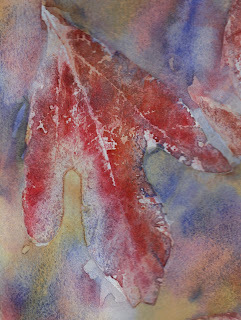 Lately, people have been urging me to do more leaf paintings. It's a little early in the year for them, but I pulled everything out to give it a shot. You have to find the right cutting. The shape, the veins, the condition (lots of little bugs inhabit leaves)...and the funny thing is, and it's perhaps the length of time the leaf is exposed to the elements over the duration of several seasons, before they fall, or the cold air at night in the early fall, summer leaves are tough to deal with. They have waxy surfaces and resist water and paint. I won't tell you what I do to prepare them pre-season (that's a trade secret), but I took out my scissors, took some cuttings, got a dozen together. and spent about eight hours, on and off, to come up with basically one picture. My leaf paintings are all original, one-of-a-kind, productions. Prepared on a quarter sheet, if all are successful, I might get one really good big painting or five or six small ones. I learned the trick of cutting paintings down one year on Monhegan Island, many years ago. Fred Wiley, a well-known Monhegan artist, was visiting our group of painters. I had a poor painting going and was ready to trash it when Fred stopped me. He whipped out a small mat and moved it to a part of the painting where something was hiding. "In every bad painting there's a beautiful postcard," he said. With that little action of his, voila, there it was, my first cutting. If I'm lucky and the painting is a really big bad one, I can get two or three cuttings. Since then, I've painted with abandon knowing that something will be there that will be worth framing. Okay, not every time, and not with complete abandon. Some times, very few times, I just paint to paint. I actually try very hard to paint well and still throw a bunch of stuff away. Over the years, my leaf cutting and painting processes have resulted in some outright gems and many worthy cuttings. This one, a piece of quarter sheet is a cutting. When they go really bad, and with this process many do, I cut the sheets into strips, five or six inches long and a couple of inches across and end up with hundreds of abstract book marks. So, today, from my cuttings, one painting and sixty-seven book marks. Can't tell you what tomorrow will bring, but I always look for the right cutting. By the way, those six pieces of paper may have resulted in six pictures that one could argue, if done well, matted and framed, might bring several hundred dollars each. That being the case, I'd welcome $1800.00 for this one. If anyone is interested, contact me right away. I don't have $1800, but I would love to have 23 of the bookmarks!! !